Today is the birthdays of both David Kuntz (June 4, 1819-July 11, 1892) and Louis Kuntz (June 4, 1852-October 8, 1891). 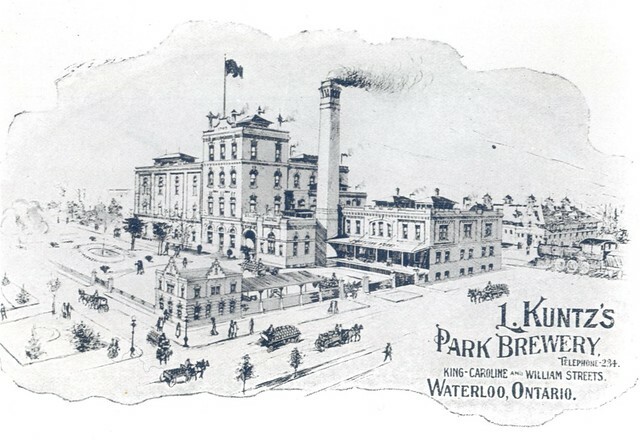 David Kuntz was born in Wiesbaden, Hessen, Germany, but moved to Waterloo City in Ontario, Canada, opening the Spring Brewery in 1844, though it was later renamed the Louis Kuntz Park Brewery. 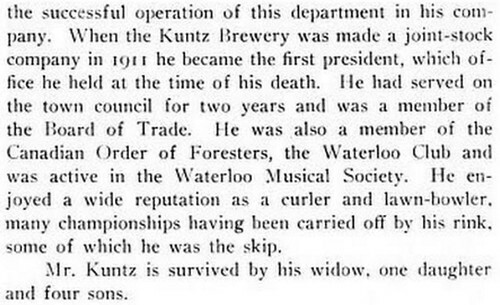 His son, Ludwig “Louis” Kuntz was born in Waterloo, Ontario, and work with his father at the family brewery, though passed away a year before his father, and the business passed to David’s grandson, and Louis’ son, David C. Kuntz. Shortly after David C’ Kuntz’s passing, in 1930, Canadian Breweries Limited, which had originally been “named Brewing Corporation of Ontario,” was created “by merging The Brading Breweries Limited, an Ottawa company Taylor had inherited from his grandfather, Capital Brewing of Ottawa, and Kuntz Brewery of Waterloo, Ontario.” In 1977 Carling Brewery was purchased by Labatt Breweries of London, but the Waterloo plant was closed by 1993 and all the buildings on the site had been demolished. David & his son Louis. David Kuntz was a pioneer brewer who helped establish Waterloo as a centre for quality beer making by undertaking every aspect of the business himself. It is written that Kuntz, a cooper as well as a brewer from Germany, made the barrels himself, brewed the beer, and actually made the bricks for the brewery he eventually built. 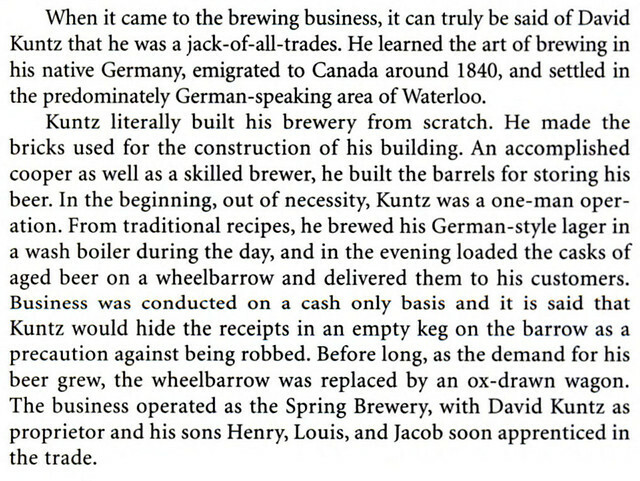 In the 1830s, Kuntz brewed his beer in an old wooden washtub during the day and made his way around the county at night, selling it from a wheelbarrow. He hid his cash from the beer sales in an empty keg to avoid being robbed. By the early 1840s, Kuntz had enough capital to purchase a brewery hotel from Christopher Huether. The building still stands at the corner of King and Princess Streets and is now known as the Huether Hotel and Lion Brewery. On a personal note, the census shows he was married to Magdelina, twenty-eight, who was also from Germany. At that time, they had four children – Ludwig, Henry, Catherine and Charles between the ages of two and eight. The couple went on to have thirteen children. 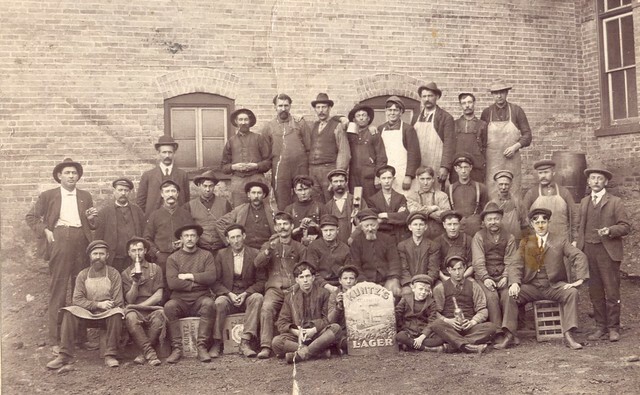 Employees of the Kuntz brewery in 1894. I suspect one of the mustacheo’d gentlemen may be Louis, but I’m not sure which one. 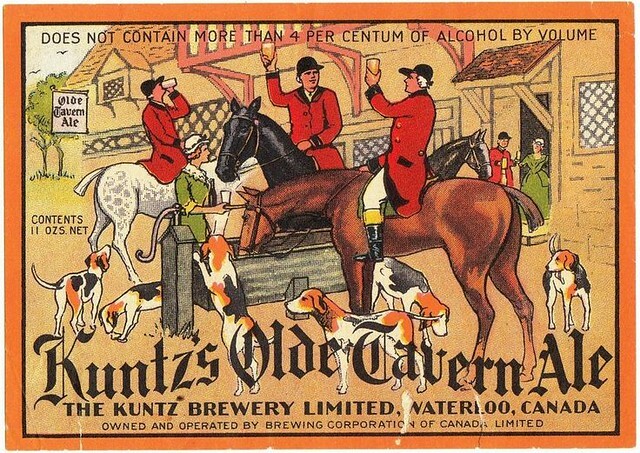 By the time of the First World War, the Kuntz Brewery was selling 90,000 barrels of beer every year and, in Ontario, was second in popularity only to Toronto’s O’Keefe brew. The Kuntz family also owned hotels including the Alexandra House in Waterloo, and the Opera House in Hamilton. After years of prohibition, the Kuntz family was dealt a fatal blow when the federal government won a tax suit valued at $200,000. 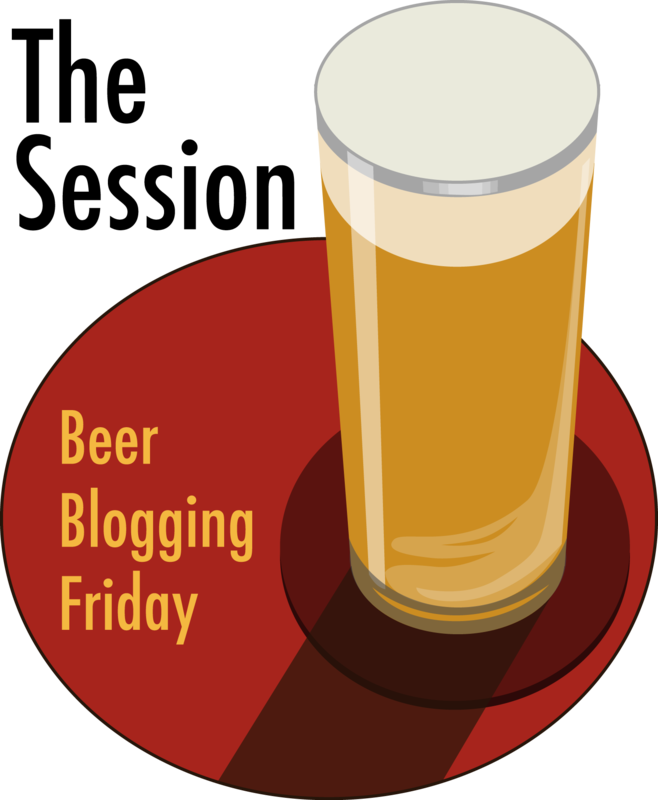 By October, Toronto’s beer magnate E.P. Taylor took control of the million dollar plant for the price of simply paying the suit. 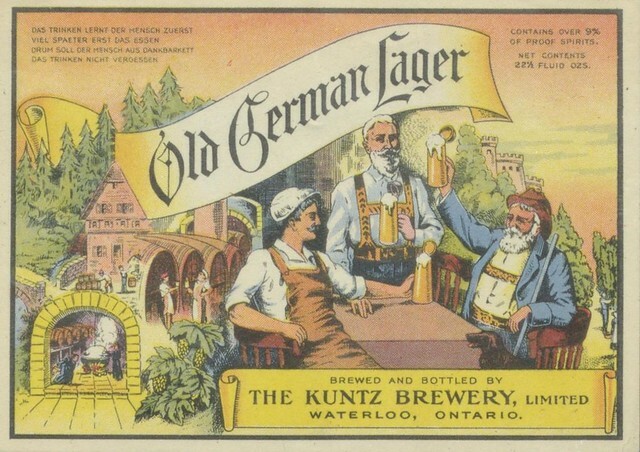 In 1936, Carling Breweries Ltd. of London, Ontario joined Kuntz, calling the business Carling-Kuntz Brewery Ltd. With the outbreak of the Second World War, the name Kuntz was dropped for sounding “too German” along with the well-loved brews Culmbacher, Bohemian and Olde German Lager. In the mid-1970s it became Carling O’Keefe and a few years later the business was sold to Labatt Breweries of London. No one alive can remember the taste of “Old German Lager” from Kuntz Spring Brewery (I don’t mean the 1988 re-brew by Labatt). 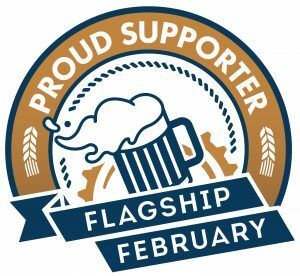 Nonetheless, Kuntz fascination continues and its ephemera are fervently sought by brewerianists — collectors of brewery items. In the 1830s, while still a teenager, David Kuntz came with older brother Jacob from the German Duchy of Nassau. After a few years working as coopers in Doon, they moved north to slightly larger Waterloo, which boasted maybe 200 inhabitants. A much-quoted anecdote says David made the bricks that helped build his first brewery; made the barrels that contained the beer; and made the wheelbarrow that helped him deliver the beer. David and Jacob’s initial brewing began around mid-century on Princess Street at the rear of Wilhelm Rebscher’s original Waterloo brewery (now the Huether Hotel site). They next built a small malting building near Erb and Queen (later renamed Regina) behind Bowman’s Hotel. Then, in the early 1860s, the brothers began constructing a full brewery at King and William streets. A fine flowing spring lured them to that corner and by 1865 the new brewery was in full production using hops and barley the brothers grew themselves. They named it Kuntz Spring Brewery. 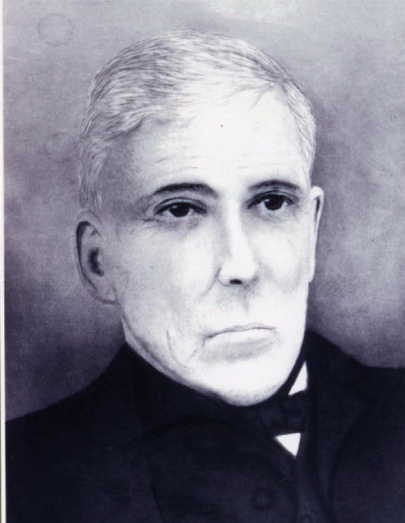 Jacob Kuntz soon expanded the Kuntz brewing empire; he moved to Carlsruhe, opened Lion Brewery and thus helped to begin Bruce County’s brewing industry. David Kuntz seems the type of entrepreneur who is never fulfilled. 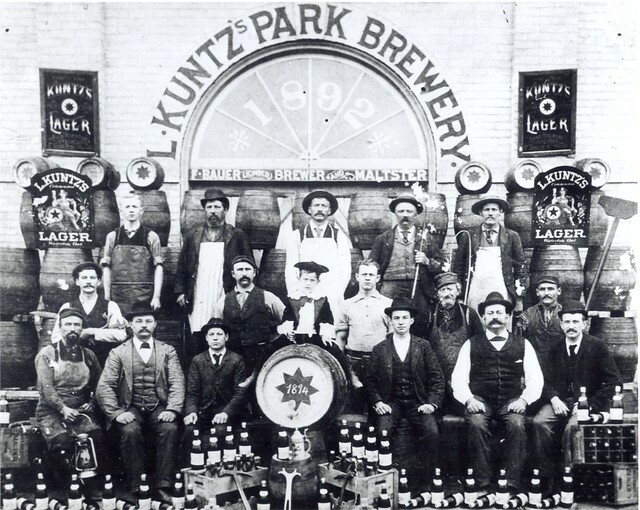 In 1870, aged 50, he turned the business over to son Louis who renamed it L. Kuntz Park Brewery, using the decorative green space in front of the brewery as the company’s trademark. In the meantime, David briefly moved to Hamilton to set up son Henry’s Dominion Brewery. Returning to Waterloo, David kept busy. He served on council during 1876 when the village became a town and erected a modern hotel, the Alexandra House, kitty-corner from the brewery. 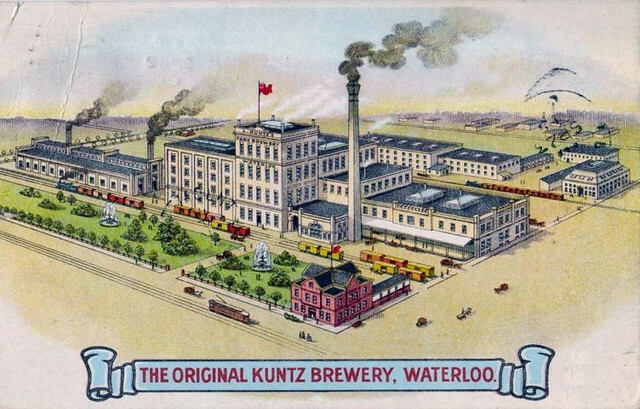 The First World War, Prohibition and a huge 1929 lawsuit loss resulted in the Kuntz name starting to fade from the brewing business. 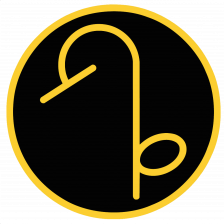 E.P. 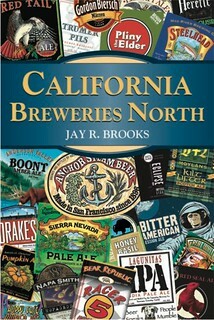 Taylor bought the struggling firm in 1929, wrapping it into his brewing empire. During the Depression, the name changed from Kuntz Breweries to Kuntz-Carling to Carling-Kuntz and finally, during the Second World War, to just Carling. The brewing site at King and William later operated under the O’Keefe and Labatt banners. What remains of the Kuntz legacy? For nostalgists, highly collectible Kuntz beer trays, bottles, bottle caps, labels, advertising, Kuntz 1920s soft drink bottles, etc. 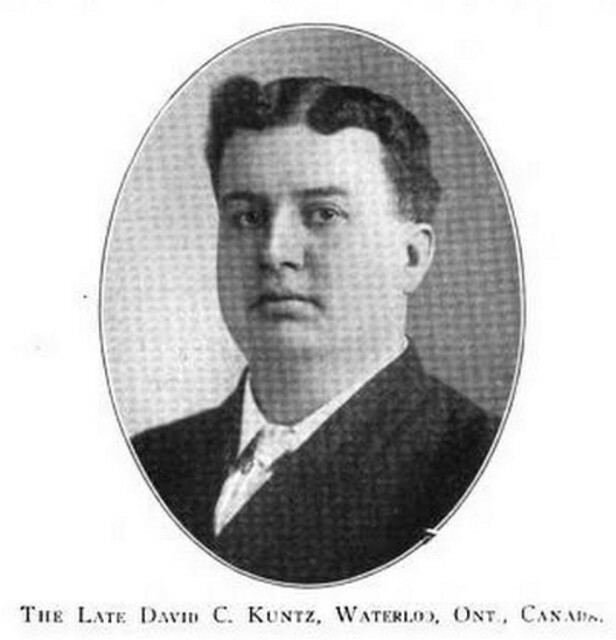 Two Waterloo houses built by David are historically designated: the 1880 Kuntz-Eckert House at 156 King St. S. and the 1885 Kuntz-Labatt House at 167. In southeast Waterloo, Kuntz sounds echo daily through the neighbourhood — one of the 1902 bells at St. Louis Roman Catholic Church is a bequest from David’s will and is named Magdalena for his wife. A myth surrounding the Kuntz early years claims streets such as Caroline, William, Mary and John were named after David’s children. A nice idea but those names appear on a map published in 1855 before all but two of the Kuntz children were born. In addition, David and Magdalena did not have children named William, Mary or John. However, from the couple’s dozen-plus children, a large clan of Kuntz family members still lives in Waterloo Region. The Kuntz name in business carries on with Kuntz Electroplating (KEI) started in 1948 by Oscar Kuntz, son of David Jr. and great-grandson of David. 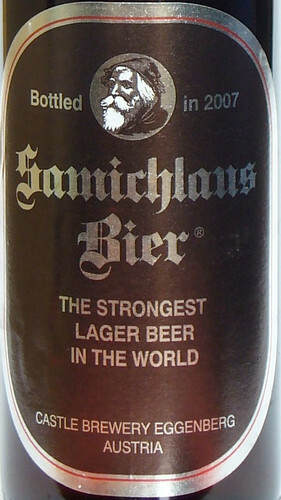 According to the Canadian National Post (sent in by an alert reader — thanks Brian S.), the LCBO — the Liquor Control Board of Ontario — has banned the Christmas beer Samichlaus, from Schloss Eggenberg. Here’s the reason, if you can even call it that. 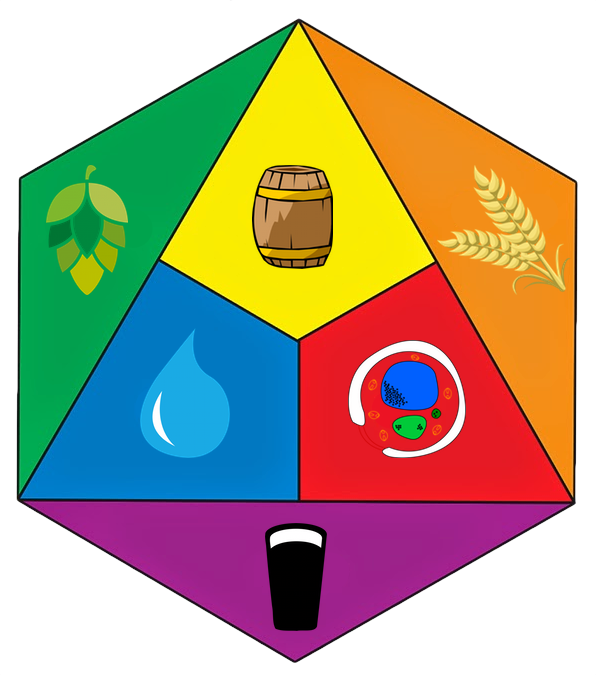 The Alcohol and Gaming Commission of Ontario has decided the beer’s label contravenes rules against advertising to children. It features the name of the beer, Samichlaus, a Swiss-German nickname for the saint behind the Santa Claus legend, and a small black-and-white bearded figure. But the notion that Santa Claus, and by extension Christmas itself, is exclusively the domain of children is absurd on its face. But set that aside for a moment, and look at the label. Have you ever seen a less kid-friendly label? Nothing pulls in kids like a brown label, almost devoid of holiday colors. And the image of Santa Claus they believe puts children at risk? As the article suggests, the label’s image looks more like an “old fisherman [o]r a weather-beaten hobo.” I just see an old man with a beard and a nondescript hat; anything but someone kids would be drawn to the dark side over. How could any reasonable person look at that label and conclude it’s “aimed” at marketing to children? Of course, Santa Claus — or St. Nicholas — is also the patron saint of brewers and the brewery only makes Samichlaus once a year, on December 6, which is his saint’s feast day. I’m not sure why this issue keeps coming up, apart from some people seem to have some very strange ideas about who Christmas is for and who gets to decide. And that brings us back to this idea that Santa Claus somehow only appeals to children and is not for adults. I don’t know who the adults are who feel this way, but they must be some of the least empathetic, most stingy, unfeeling curmudgeonly people on the planet because for me the spirit of Santa Claus is about giving, regardless of age. I’m 51, a devout non-believer, and I love Christmas and especially the idea of Santa Claus. And I know I’m not alone on this one. What’s perhaps most unsettling, is that the entire province has been mobilized to eradicate this scourge of Samichlaus based on a “single complaint from a private person.” Yes, that’s right. One person didn’t like the label and now the rest of the people in the province will be deprived this great beer. Nice going, jackass. This seems to keep happening — in the UK, Philly, San Diego and elsewhere — where the opinion of one person seems to matter more than the collective sensibilities of a whole community or society.